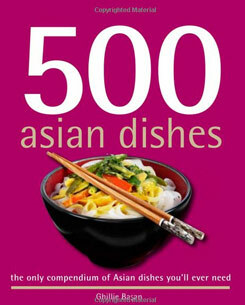 500 Asian Dishes presents a selection of dishes bursting with flavour from primary countries of the region China, Vietnam, Cambodia, Thailand, Malaysia, Singapore, Japan, Indonesia and the Philippines. Spicy and tangy, sweet and fruity, sour and fiery are the principal notes you will encounter as you embark on a voyage of soy sauce spiked with chilli and garlic; noodles in coconut milk with lemongrass and ginger; tender beef flavoured with star anise; and pearly white lychee sorbet. With 500 tantalizing recipes, you will be able to liven up the taste buds of your family and friends with an exciting meal or a fabulous party spread. With several variations provided for each dish, including vegetarian, you will be guided on how to substitute ingredients according to your taste and their availability. With 500 Asian Dishes in your kitchen you will always find something simple and creative to cook for lunch, a quick impromptu snack, dinner parties and special occasions.